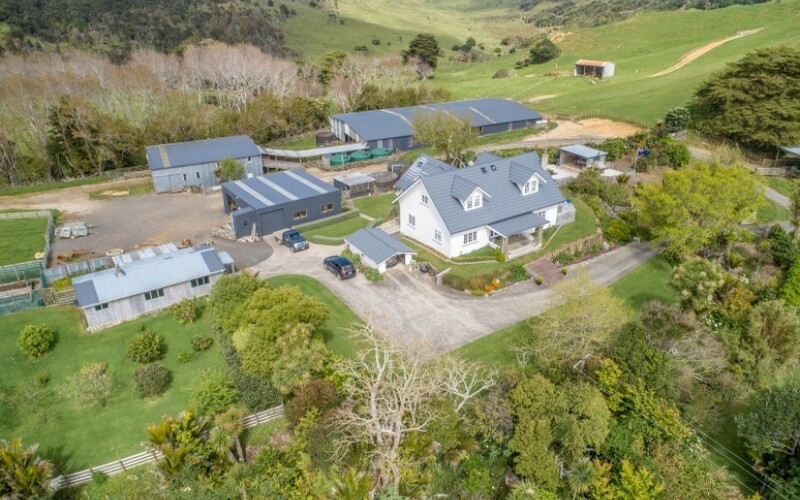 A large, picturesque coastal Port Waikato property, with a thriving farming operation and a suite of recreational attractions, is for sale for the first time in 60 years. Adrian van Mil of PGG Wrightson Real Estate, Pukekohe, is selling 540 hectare Puriri Heights on behalf of Rachel and Brook Johnstone. Rachel’s parents, Ted and Natalie Ramsden, purchased the farm in 1959. Adrian says it offers an enticing blend of isolation and proximity. 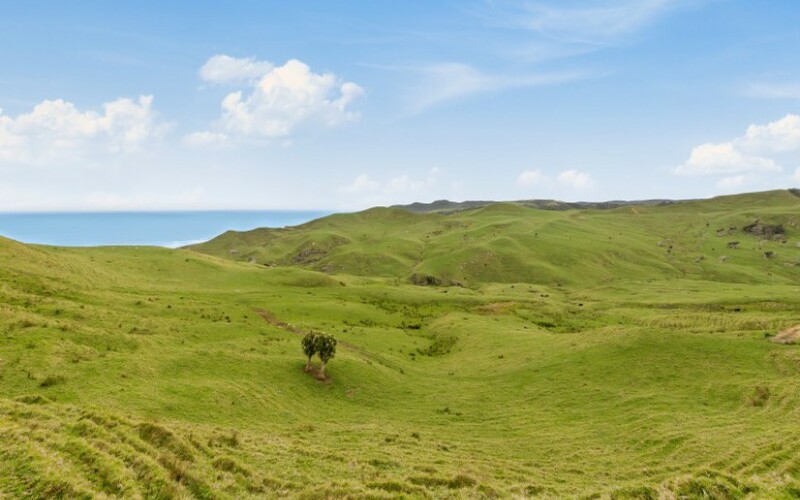 “Although just 84 kilometres south of Auckland Airport and 48 kilometres south west of Pukekohe, with its west coast grandeur and rugged coastal outlook, Puriri Heights retains a sense of remoteness that is surprising considering how close it is to the city. “Currently breeding sheep and beef, the farm is only part of the story. Between two and three kilometres of secluded sandy beaches, access to low water mussel beds, exceptional fishing, various hunting opportunities, and a network of limestone caves make the property a classic kiwi outdoor playground that can be enjoyed as is, or developed by a new owner as a tourism venture,” he said. Rachel and Brook Johnstone have farmed Puriri Heights since late 2007. “We were late comers to farming. Although I was born here, I had been away for more than 30 years. Brook was previously a helicopter pilot, and I was an intensive care paramedic. My parents had passed on the property to my brother, though he was diagnosed with a terminal illness. As that progressed, he was no longer able to actively farm and it fell to us to take over,” Rachel said. Ted Ramsden returned to New Zealand after serving in the RNZAF in the Pacific during World War II determined to turn himself into a farmer. He first saw Puriri Heights advertised for sale in 1952 and although he liked the look of it, was not in a position to purchase. When the farm was offered for sale again a few years later, he was better placed to persuade the bank to back him. He and Natalie moved north from Taranaki in the middle of winter 1959, traveling to this isolated spot along gravel roads and one-way bridges with a truckload of furniture, dogs and two young children. Initially times were tough, and beachcombing for washed up timber to build yards and fence the farm was a family practice in the early days. Developing a reputation for breeding stock, though, for which he collected many awards, Ted focused on Romney sheep and Angus cattle. By the 1970s the farm was well established and the annual wool cheque had brought the mortgage under control, also putting the four Ramsden children through private schools. Fast forward 40 years and with wool’s fortunes declining, after Rachel and Brook took over, they decided to introduce Wiltshire self-shedding sheep to Puriri Heights. “At first the neighbours thought we were mad, shifting completely away from wool. However, it proved right for us and the farm. We have improved the lambing percentage from about 90 to 147 per cent; we don’t shear, dip, dag or dock the Wiltshires; there are no bearings in the ewes in our flock anymore; we have set the farm up to be run by one man; and we are also successfully selling rams and breeding ewes, trading as Puriri Wiltshire. 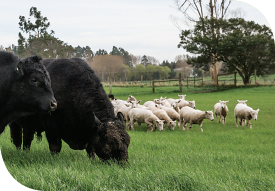 “Although going out of wool and shifting solely to lamb production was a big call, it has paid off in terms of profitability, while also making the farm easier to manage,” said Brook. While the farm has changed, a constant has been the natural magnificence and variety of its location, as Rachel explains. “We spend as much free time as possible on the beach, either picnicking or fishing. It is easy to feel the isolation here. Apart from through the farm, access to the shore is difficult, so we generally have it to ourselves. Friends and family love sharing holidays with us,” she says. Stands of the farm’s native bush have been covenanted to protect fauna and bird life. Well-known locally, and an attraction for speleologists, is Puriri Heights’ network of limestone caves. Historically a site for Maori burial, they take a couple of hours to walk through. Adrian van Mil says Puriri Heights’ coastal character, proximity to Auckland and farming operation are a rare combination. “Properties with as much character as this are jealously guarded, hence remaining in the same family for 60 years. As a farm, Puriri Heights is an easy-care enterprise with carrying capacity for approximately 5000 stock units, while its outdoor lifestyle characteristics are unsurpassed, and waiting to be enjoyed by a new owner. “Puriri Heights’ homestead is a three-bedroom plus office dwelling built in 1929 and extensively renovated in 2009, which is surrounded by outdoor entertainment areas, large decks and a fully fenced orchard vegetable garden, including hothouse. A three-bedroom manager’s home is also situated on the farm. “One recent addition is the reticulated water scheme, which taps a limestone artesian spring to provide reliable year round domestic and stock water across the whole farm,” he said. Puriri Heights is for sale by tender, with offers sought by 5 December.